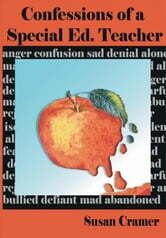 In her debut work, Confessions of a Special Ed. Teacher, Susan Cramer tells of her feelings and experiences in her journey to teach these special children. Using a humorous style, Susan has created a book that will evoke in others a newfound hope, inspiration, and understanding of special needs children. Chapters in the book take the reader through the educational process of identifying children with emotional disabilities, creating an IEP, capturing and holding the attention of special needs children, making modifications and adaptations, and implementing behavioral strategies used in her classroom to attain academic and emotional success in the lives of her students. She sprinkles throughout the book controversial issues all too common in her profession: teacher burnout, overcrowded classrooms, budget shortfalls, ineffective administrators, pushy politicians, and absentee parents. She allows the reader to glimpse into her inner sanctum of the teacher's lounge and the antics that keep her of sane mind and body before and after school hours. Then she presents the reader with heart-wrenching stories about those special students who have touched her very soul. Through a combination of tough love, old-school tactics, compassion and humor the author is able to get the students to trust and open up to her in their quest to be successful for school. A "must read" for parents, educators, administrators and prospective collegiate education majors.